if you're tied to the ground? Worried about missing out if you're tied to the ground? There is no doubt: The Cloud is the future, offering benefits organizations can’t afford to pass up. However, while some organizations have moved fully into the Cloud, many are not ready to go “all in.” This might be due to budget, timing, specific business needs or conditions, or simply the availability of a Cloud-based version of a business-critical application. Whatever the reason, we understand—but we are also confident you can benefit from the power of the Cloud. Enter the hybrid Cloud–using Cloud technologies to combine solutions like Microsoft Dynamics 365 with on-premise systems behind firewalls, with the goal of seamless operations. 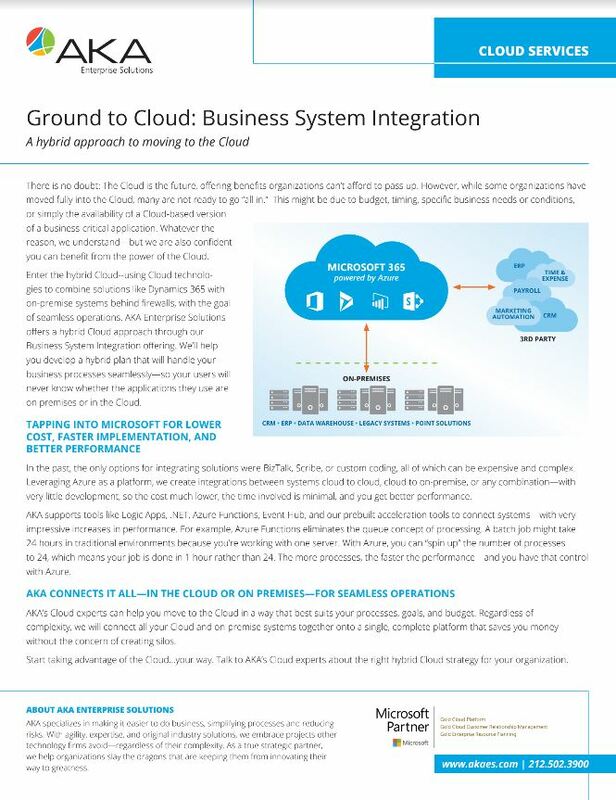 AKA Enterprise Solutions offers a hybrid Cloud approach through our Business System Integration offering. We’ll help you develop a hybrid plan that will handle your business processes seamlessly—so your users will never know whether the applications they use are on premises or in the Cloud. In the past, the only options for integrating solutions were BizTalk, Scribe, or custom coding, all of which can be expensive and complex. Leveraging Azure as a platform, we create integrations between systems cloud to cloud, cloud to on-premise, or any combination—with very little development, so the cost much lower, the time involved is minimal, and you get better performance. AKA supports tools like Logic Apps, .NET, Azure Functions, Event Hub, and our prebuilt acceleration tools to connect systems—with very impressive increases in performance. For example, Azure Functions eliminates the queue concept of processing. A batch job might take 24 hours in traditional environments because you’re working with one server. With Azure, you can “spin up” the number of processes to 24, which means your job is done in 1 hour rather than 24. The more processes, the faster the performance—and you have that control with Azure. AKA’s Cloud experts can help you move to the Cloud in a way that best suits your processes, goals, and budget. Regardless of complexity, we will connect all your Cloud and on-premise systems together onto a single, complete platform that saves you money— without the concern of creating silos. 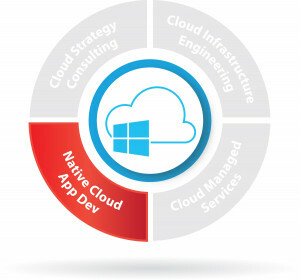 Start taking advantage of the Cloud…your way. Talk to AKA’s Cloud experts about the right hybrid Cloud strategy for your organization.